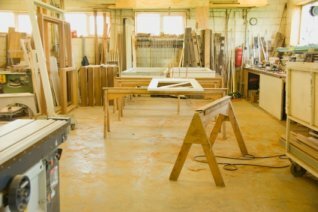 If you are DIYer or just new to carpentry you'll want to know some basic carpentry skills, techniques, tips, tricks of the trade and ideas to help get you started. Hopefully the information on the following pages will help you avoid some of the pitfalls commonly faced and to get a perfect finish with your project. My choice of Carpentry books & Manuals that are worth a look at. Many of the most common Carpentry Terms explained - cut through the jargon and familiarise yourself with these carpentry terms you've heard and wondered what they meant. Check out the different types of wood glue I use on a daily basis for all sorts of different tasks. Learn what is a Leading edge is - how you cut one and how it helps in various given situations? Carpenters need to read technical drawings with a scale ruler and then transfer the measurements on the job site. Using a scale ruler is like using a normal rule, only you need to find the side with the corresponding scale that the drawing is working to. Click here for a list of commonly used carpentry formulas each with explanations you can understand!